The weather was perfect – a north-easterly Force 5 blowing in across the North Sea all the way from Norway. Not something we would normally relish when sitting beam on to the sea in a 65ft flybridge boat. However, these conditions were just what was needed to put Sleipner’s new Vector stabiliser fins to the test. Nor was this a specially arranged press event designed to demonstrate their ability to best advantage, MBY was simply invited to join the team of engineers from Fairline, Caterpillar and Sleipner taking part in the commissioning process of the first new Squadron 65 fitted with these intriguing new stabilisers. First revealed in these pages last November, the zero-speed Vector fin stabilisers use an unusual curved design to deliver more thrust from a shorter, more compact fin design. Vector believe this compact design is a winner because the curved shape ensures the fin is closer to the horizontal than a straight fin, producing more of the useful vertical thrust needed to counteract roll. It also produces less lateral thrust reducing unwanted yaw. Sleipner claims that Vector fins are 50% more efficient than a comparable straight fin at anchor and 30% more efficient underway. Crucially this means the surface area of the fins can be reduced and their associated drag through the water while still delivering the same anti-roll performance. On a planing boat such as this, that can make a significant difference to both performance and fuel efficiency. In fact Sunseeker, which also offers them as an option on some models, reckons that Vector fins cause no discernible loss of performance. Our Fairline 65 test boat was powered by twin 1,136hp Caterpillar C18s. We bashed out into the North Sea with the fins set in their low drag position and recorded an impressive 34 knots. However, the real test was to bring the craft to a halt beam on to the sea to see how it would cope. Up on the flybridge with the system switched off, the swell had our camera and tripod doing its best to escape overboard. The horizon rocked violently from side to side in the viewfinder and it quickly became apparent why the crew weren’t keen to hang around like this for any longer than necessary. Moments later, with the system switched on, it was like some invisible hand had mysteriously steadied the ship. The alarming roll was cut down to a gentle, comfortable rocking motion and colour once again returned to the faces of the crew. When we turned into the wind, as you would be at anchor, even the gentle rocking motion disappeared. Running back to the river entrance at semi-displacement speed, again with the sea on our beam, the additional dynamic stability generated by the Vector fins slicing through the water kept us on an impressively even keel. Considering we were doing 14 knots at most I would have expected some side-to-side movement but the only movement we could see was on the helm display showing which way the fins were pointing. The brain of the system is a roll sensor while the heart is a powerful hydraulic-pump rapidly pushing the big actuators back and forth and swivelling the fins to generate lift. 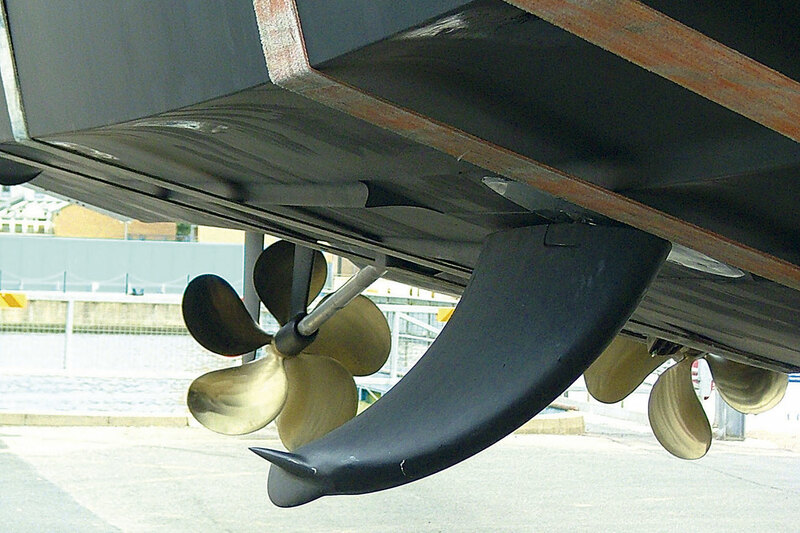 In the right weather conditions these fins can rotate through a 76¬∞ arc in less than a second. In order to do this the hydraulic system can produce up to 3000ft/lbs (4,000nm) of twisting power. Under way the pump is driven by the power take-off (PTO) from one of the engines. At anchor the generator kicks in automatically to keep the hydraulic pump on the go, although with sufficient battery power on tap they can run on DC power for a limited period of time. The whole system is operated from a control panel at the helm. The SPS55 actuators used on the Squadron 65 are substantial pieces of kit weighing 100kg each with dimensions of 51x43cm (length x width). However, they are only 15cm deep making them relatively easy to locate under the floor of most craft of 50ft or more. On the Squadron they are located under the port side heads. Sleipner is particularly proud of the way its actuators have been engineered to deliver both the power and speed needed to cope with challenging conditions at anchor. 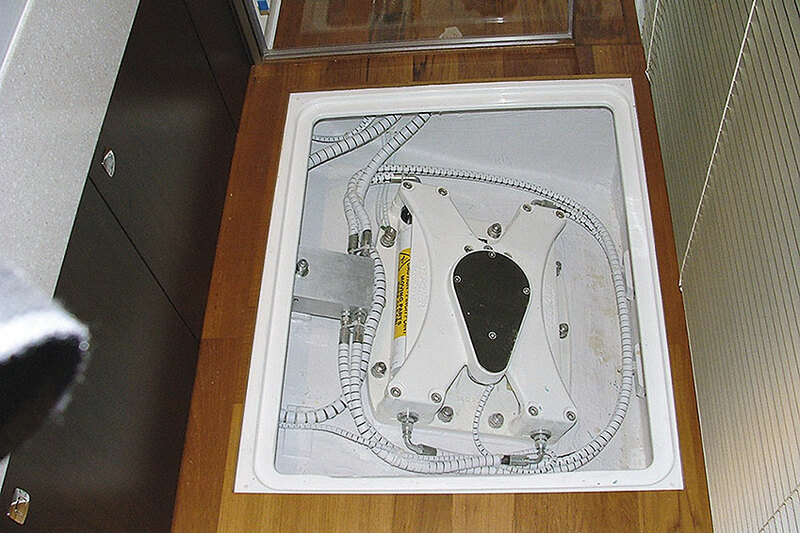 Watching the actuators at work through an inspection hatch, I was surprised to see how frequently and rapidly they react although the adjustments underway tend to be fairly small movements. At anchor they have to move further and faster to generate the lift required. The Squadron 65 uses the smaller of the two fin options for the SPS55 actuators. Measuring 4ft 8in long by 2ft 3in wide, they have a surface area of 0.65m². The largest Vector fins have a surface area of 2m² and can cater for boats up to 130ft long but significantly the smallest fins are also suitable for boats down to 50ft, provided you can stomach the cost. The price of factory fitting this option to a Fairline Squadron 65 is around £100,000 including VAT. Retro fitment to an existing craft of similar dimensions is also possible for much the same price. Sea Sickness – what’s the cause? Seasickness is a form of motion sickness. The cause of seasickness is usually an uncomfortable and continuous swell or rocking motion. Many will develop immunity to seasickness after a period of time at sea and some will never defeat it. Admiral Nelson suffered from seasickness throughout his career. Motion sickness is caused by conflicting messages being sent to your brain by your eyes and your body. It can either be motion that is felt but not seen or motion that is seen but not felt or a combination of both. This explains why it is possible to feel queasy when watching video footage from a rolling boat even when seated comfortably on dry land. One theory is that seasickness is linked to the body’s natural defence mechanism against poisoning. The area of the brain responsible for inducing vomiting when poison is detected is also responsible for coordinating vision and balance. When the signals from your eyes do not match those from your vestibular system (the inner ear labyrinth responsible for balance) the brain considers you have been poisoned causing vomiting to expel the poison. There are many means of reducing seasickness: focusing on the horizon and taking preventative tablets well in advance of going to sea tend to be the most popular and proven options. Some people also swear by wristbands with pressure beads or electronic pulses to reduce the symptoms or at least distract you from them. First published in the September 2014 issue of the magazine.